Might as well end a banner year with a bang, right? Tanukineiri and House Of Tapes both had strong years – and they’ve basically been tied together in 2013, House Of Tapes being one of two obvious candidates as the label’s major musical representative (the other is May.e). So, for the Nagoya producers third album, why not put out a digital release that actually seeks to make a little money too? Release it on iTunes, Amazon and even Spotify (no excuses, non-Japan readers), and now Tanukineiri is making strides beyond being a simple netlabel. That’s Warped Colors from the imprint’s side. For House Of Tapes, this is the final proof that the project has moved beyond the black-hole-conjuring beats making up the bulk of his first two albums. 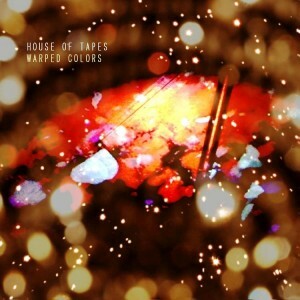 Warped Colors features the aggression that has earned him attention, but it also finds House Of Tapes trying out some new sonic twists. “Mellow Days” is practically two different songs stringed into one, full of twinkles and (a few) gritty synth drills. Vocals…whether shrouded in mist (“Twinkle”) or scrabbled messes (“Mass”)…appear more than ever before. Most importantly, House Of Tapes is really experimenting with structure – before, he was making pure sonic battering rams. Now these songs have lots of twists and turns…along with a physical edge…and Warped Colors is a very rewarding listen. Get it on iTunes, Amazon or stream it on Spotify.